EMI, which was recently sold to Universal, is conducting some serious market research into how, when and why people purchase music. 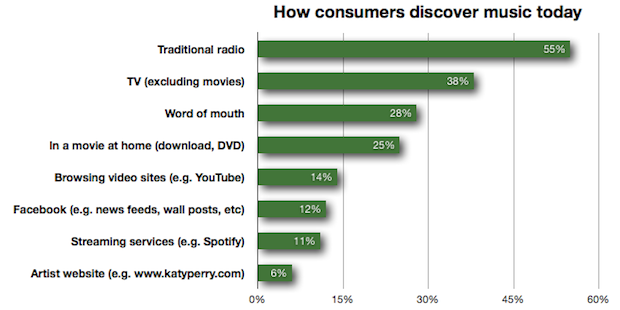 Contrary to a lot of expectations their research with 16,000 people in the USA aged over 25 shows that despite all the digital discovery options and awfully clever digital music startups, traditional radio, TV and inclusion in movies are still way out front in terms of influence on purchase decisions. OK this is an over 25 audience but they tend to be the people with the purchasing power so it should be taken seriously. I would have expected Facebook to feature higher since it is almost a form of word of mouth. Maybe if they had asked about all social media (including Twitter, etc) it would have moved up a little. Facebook is undoubtedly the big one though and yet the figure is only 12%. What I find particularly interesting is that the streaming services such as Spotify and Pandora, which claim to serve you music you’ll like, have a tiny influence. Of course, podcasts don’t appear on there but I rather suspect that they function more like radio than blogs and Facebook. The content on most music podcasts is carefully curated by a producer who brings personality and enthusiasm to the presentation, just like some radio. What do you make of the figures? Where do you hear about music you end up buying?